And it seemed interesting. Looking at it is seems that A is the midpoint of the arc, so equidistant from b and the lower left corner of the square. This would mean that an isosceles triangle exists in the semi-circle, which in turn implies the square has side length 4rt2 (from Pythagoras’s Theorem, as the side of the square is a diameter). This means the square has area 32cm^2. The semi-circles have radius 2rt2 and as such have area 4pi. That leaves just the white circle. The diagonal of the square is a diameter of this, and as the side lengths are 4rt2 the diagonal must be 8 (again via Pythagoras’s Theorem). This means the circle must have a radius of 4 and hence an area of 16pi. 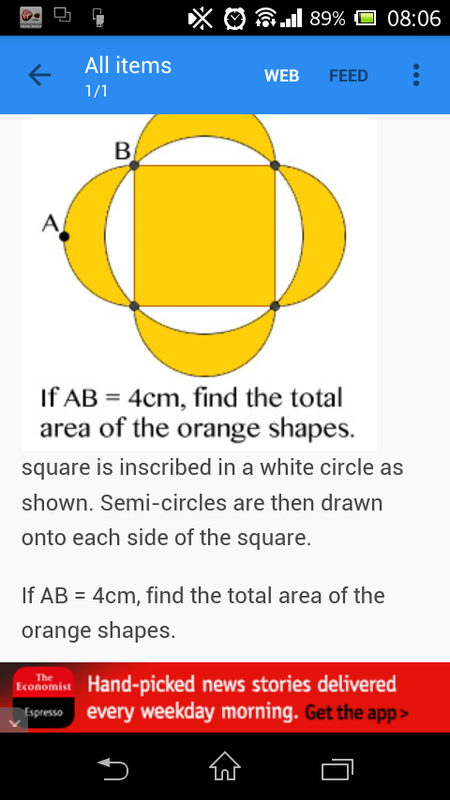 So the sum of the orange areas must equal the square add the 4 Semi-Circles subtract the circle add the square. A lovely solution, and one which shows us that the areas of the orange crescents equal the area of the square. Towards the end of the working I realised I could have used another property of Pythagoras’s Theorem, namely that the sum of the areas of semi-circles on the two shorter sides equals the area of the semi-circle on the hypotenuse. By splitting the square into two right angled triangles I could have reasoned that the 4 smaller semi-circles provide the same area as the large circle. Which means we would get the total area to be the area of the square, add the area of the circle (from the semi-circles) subtract the area of the circle (from the circle) add the area of the square. Which again simplifies to twice the area if the square. A much more elegant solution. I’ve just read your secret teacher letter to Ofsted in the guardian and I have to say I was unimpressed. You mention time and time again that you’ve done things to tick boxes because that’s what you thought the rules were. That’s not what it should be about. You should be doing things because they improve outcomes for the learners in your care. Perhaps if you had focused in this your inspection might have gone better. Maybe the inspector arrived to find a senior management team so obsessed with box ticking that the learners were being left behind, as that’s what your letter implies. Are you a real human, or an automaton? You talk of “cutting the deadwood” and “only taking the best with us”, so what, you have turned a load of struggling teachers out on the streets? With no jobs and families to feed? And what have you based your criteria on, the same tick boxes you thought were wanted but it turns out you were wrong about? Why not try to support these teachers in becoming “the best” and take them with you? Your learners and your staff are people, not numbers on a data sheet. Your role as a management team is to ensure staff and students are growing, developing and improving. Perhaps the fact you have missed that, and become obsessed with box ticking, has been your downfall. Stop worrying about “the rules of the game”, it’s not a game, it’s real life, these are real people and you are in a position with comes with a duty of care. Switch your focus, create the conditions for growth required for staff and students, see the outcomes improve for all. That’s what is important here. The answer to both is simple, it is because we are teaching maths to give you an understanding of the subject, and as such an understanding of the world. I worry that in some classrooms students are just given formulae and told algorithms to solve things. This could even be effective as long as the exam papers are predictable and you can recognise what you need to do in the question. But it leads to no deeper understanding and reduces the whole subject to basic substitution and makes a farce of the whole matter. I feel this has been entirely doable on the current GCSE, and I hope the new specifications will see papers that test a deeper knowledge and understanding of mathematical concepts. I hope that the new specifications mean more testing of the ability to select the correct maths to solve a problem, which is a real mathematical skill. If the GCSE manages this it may lead to learners being more A level ready, and allow for more rounded mathematicians going forward. It will hopefully see more students understand the beauty of the subject, and see how much fun it can be. Recently the excellent Mark Miller (@GoldfishBowlMM) has written a couple of posts around trying to improve as a teacher. In the first one he spoke about the importance of subject specific pedagogy, and how departments an see excellent results if they give over time to developing together. In the second he wrote about how he’s developed his teaching by striving to become a better English teacher and the subject specific ideas that have helped him. Ironically, I read the post and saw many links to mathematics teaching and how these ideas can help us all improve in our own subjects! But the idea that focused, subject specific CPD is the future is one I’m totally on board with. I remember as an ITE trainee sitting through a lecture on Bloom’s Taxonomy where all the examples were history and English. I saw the examples and how they might make a difference in those subjects, but I couldn’t see at all how they would relate to maths. It wasn’t until a long time later and a discussion with my NQT mentor that I finally realised. Robin Alexander wrote in 2010 that he feels the key to improving teaching is to get teachers talking about pedagogy, and I’d certainly agree with that. I feel that there is plenty to discuss in general, but that subject specific pedagogy discussion is even more important. So get involved! Get involved online, read blogs, comment, write your own (use WordPress!) and engage with Twitter. There are thousands of maths teachers all over the world waiting to exchange ideas. But also get involved within your department. Share your ideas with your colleagues and ask them what they think, ask how they approach those subjects and try to get the discussions started. I keep my mathematical abilities sharp, I engage with puzzles, I read around my subject and I discussed maths with others. I do these things because I enjoy them, but I feel that they have made me better as a maths teacher. There are many books you can read, apps and websites you can get involved with and puzzles you can try. They are fun and helpful. I often try new approaches in lessons, whether it be a new activity I’ve seen or heard about, or another method or a new pedagogical approach. I think when trying these things it’s important to remember that things aren’t always importable. Something that works for me in my setting may not work for you in yours, but it’s worth trying out and then refining if necessary. I’d also say if something fails once, that doesn’t mean it isn’t worth trying again, with a different class. I put within reason as it can be tempting to try everything, and if you try too much all at once it all gets lost within each other and you can’t pick out the impact for anything you’ve tried. Whether you’re marking books, homeworks or exam papers, have something with you to make notes with. If there’s a misconception that keeps cropping up, make a note or take a snap. You need to address it in the next lesson. I also like to show examples of great work too. These are a few of the things I do, on a regular basis, that I feel help me improve. I hope they have given you some ideas. If you have other points to add, please use the comments. Skills vs Knowledge – Is it really a contest? A lot has been written on knowledge and skill, and the trade off that seems apparent in the debate. It’s a topic I’ve generally stayed away from, mainly because I’m a little confused about the whole thing. Recently, however, someone asked me my opinion on the matter and I wanted to try and get my thoughts in order. When I was growing up my mother always said that I did better at maths than anything else because it was skills based, and I was too lazy to learn knowledge so skills based subjects were better for me. I never really questioned this, but before Christmas I heard an English teacher tell one of his students that English wasn’t like maths, it was a skills based subject rather than a knowledge based subject. This alternative views are something to ponder, is maths knowledge based or skills based? Algebraic manipulation seems to be a skill, but that skill is really using the knowledge of the order of operations and inverse operations to manipulate formulae. It’s hard to imagine a maths syllabus that detaches the two. 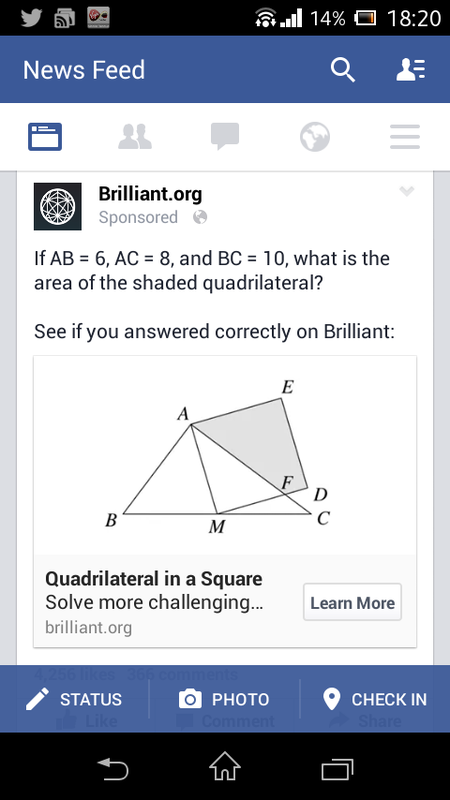 Solving geometric puzzles, such as this one, is a skill. But it’s a skill that is heavily rooted in the knowledge of trigonometry, Pythagoras’s Theorem, similar triangles, angle sums and many other things. Again, it’s hard to detach them. One don’t think maths is either, or maybe I should say it’s both? I recently wrote this post on problem solving, and it seems to me to illustrate the close links between knowledge and skills in maths. The skills discussed in it are the skills of sketching and deduction, but without a good foundation of maths knowledge you can sketch and deduce till the cows come home, and still be no wiser. I wondered if other subjects were the same. I thought about English, as I’d heard a colleague say it was skill based. This seemed to be a fair point at first, you write to analyse, to argue, to describe, surely these are skills? Well yes, but without knowledge of how to use the language, knowledge of a wider context, knowledge of other views, how can you do this competently? What about History? It’s about knowledge right? You learn a load of dates and facts and regurgitate them? But no, actually you need to be able to analyse given sources and combine this with your knowledge to make a coherent argument. The EPQ, surely the pinnacle of skill only, you teach them the skills and away they go. Indeed, and here we can have a skill only curriculum, but each project will be rich with knowledge, it just will be different knowledge. I’m not sure. I can’t see a way to separate skills from knowledge, so I can’t see what the fuss is about. Skills and knowledge depend on each other, and we need to ensure we are working on strategies to impart both onto our charges to prepare them for the future. This post is part of the February 2015 #blogsync which has been inspired by James Mannion’s (@pedagog_machine) request for opinions on the topic as part of his research. You can read the other posts here, and you can read James’s Rationale on the idea here. 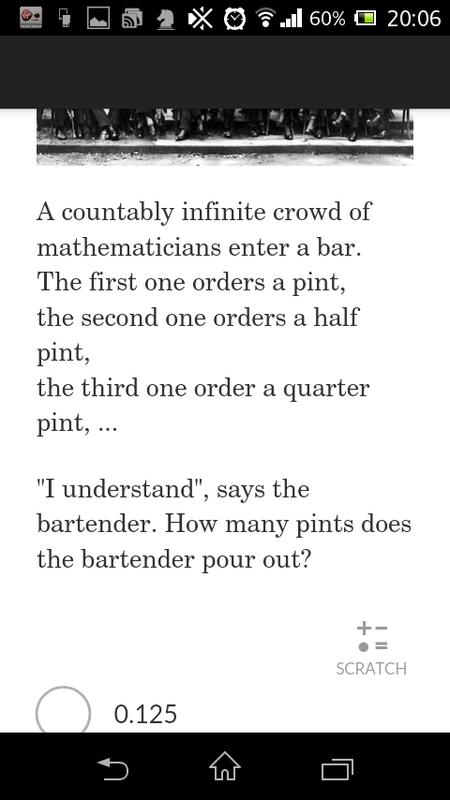 Over the weekend I read this post by Jo Morgan (@mathsjem). In it she refers to a website “brilliant.org” which offers some brilliant stuff to be used in maths teaching. I liked the look of it so I set off to investigate and when I accessed the site I was presented with a pop up asking if I wanted to download the app, which I promptly did. 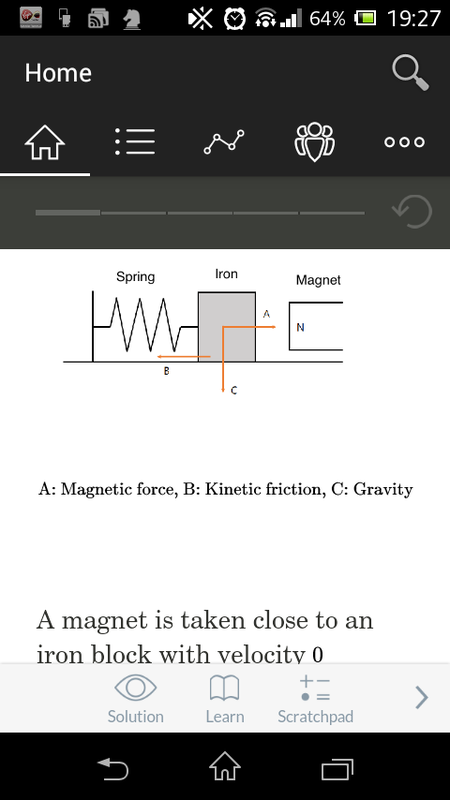 When I accessed the app I was presented with a number of mini quizzes which covered a range of early KS3 material, but on further exploration I discovered a treasure trove of fantastic questions and explanations of topics ranging from very basic up to degree level. On top of this there are some fantastic puzzles to solve and the app tracks what you have done and how well you have on it. I found it really fun, I enjoyed testing my knowledge on some of tge further mechanics and am looking forward to attempting some of the puzzles. I think this app is brilliant for anyone who loves maths, whether they be studying it at school, at university, teach it or just enjoy keeping themselves smart. There is also the chance to subscribe to additional content, I haven’t yet but I am tempted. The additional content seems to be more worked solutions to the quizzes, but I think I’ll see how much I use the app before I upgrade. I do love the prices too, it’s £tau pounds a month, but if you sign up for a year they reduce it to £pi – a lovely touch. 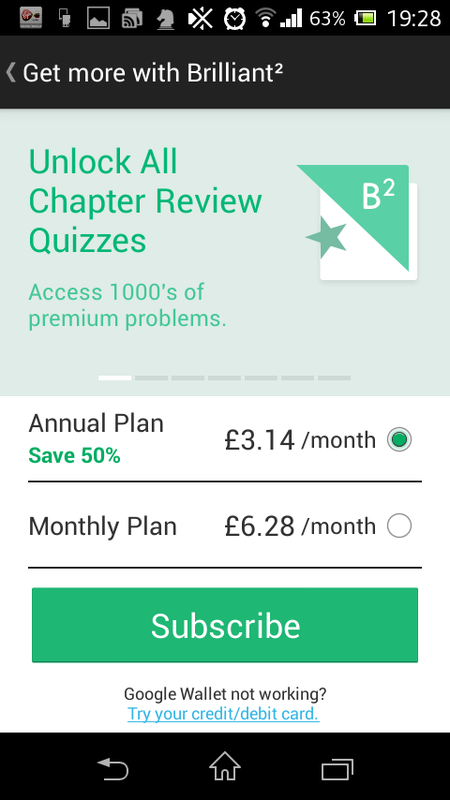 A great app, if you love maths, get it and if you’re studying maths it will help immensely. 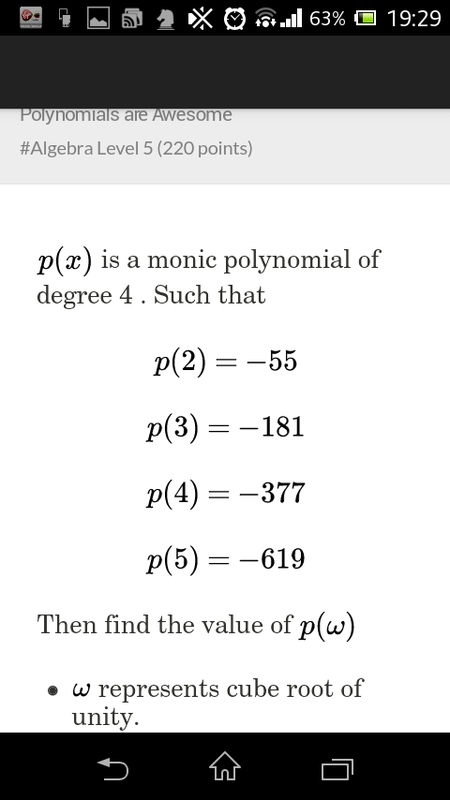 You may have noticed that I write a lot of posts looking at my approach to solving maths puzzles. If not, you can see them here. I think the skills involved in problem solving are very important in mathematics, and I’m general life. I feel that we, as maths teachers, need to be equipping our students with the tools to tackle these problems, not least due to the shift in focus on the new GCSE and A Level specifications towards problem solving. I think that by showing them these puzzles, and modelling our approach to solving them, we can make a great start. Sketching is something that I find students very reluctant to do, and it infuriates me. Very often a puzzle or problem becomes much simpler once a sketch has been made. Take quadratic inequalities for example, once you have sketched it is is straightforward to choose which region you need. But still each year I find at least a few year 12 students who hand in work, mock papers even, without sketches. It’s not limited to quadratic inequalities though, any geometric puzzle, any algebraic puzzle and many stats, combinatorics, topological puzzles can be simplified with a sketch. So if you, SKETCH IT! It often shows you the way to solve it. This is a question I find I ask a,lot during lessons when students are struggling to begin a question. 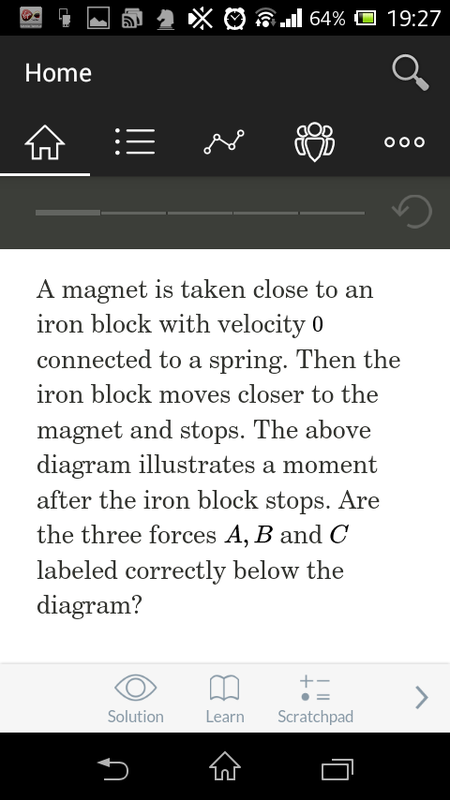 C1 and C2 sequence questions give rise to it all the time. Students need to learn how to identify key information, and rewriting each bit of information away from the question can really help, especially if the question is wordy. For example a year 12 student this week was struggling to start a particular wordy arithmetic progression question on a past paper. I asked him what info he could gain front the question, once he wrote it out underneath he could see he had 2 simultaneous equations to solve for a and d.
This is a tactic students need to learn, and it ties to sketching too. I always tell my students Ince they’ve sketched they need to fill in any other info they know onto the sketch, it helps them clarify what they know and where they can go next. This is often enough to show a route to a solution. What else can you deduce? When I’m solving a puzzle this is the third question I ask myself. I’ve sketched if appropriate and I’ve specified what I know, next I look at what else I can deduce. In a geometric puzzle it could be angles, lengths or areas. In an algebraic puzzle it may be there are easy to calculate variables, if there are surds involved it may mean rationalising denominators. This step can be the key, it often gives rise to a hidden piece of information which makes the puzzle easy to solve. It could be the realisation that two triangles are similar or congruent, it could be a missing side, or angle, that allows you to calculate more. Or it could be a way to work out one variable, that would lead to finding the one you actually want. These three key questions are part of the problem solving journey, and they are ones I try to encourage all my students to use for those problems where they don’t know where to start.